Egypt's Foreign Minister Sameh Shoukry will visit South Sudan on Wednesday, followed by a visit to Eritrea, according to a foreign ministry statement. The minister will discuss with his counterparts questions of terrorism, the situation in South Sudan, and the Horn of Africa region in terms of development and stability issues. Eritrean President Isaias Afwerki visited Egypt in September 2014. 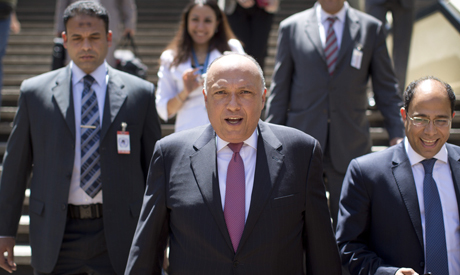 Also, Shoukry and Eritrean Foreign Minister Othman Saleh Mohamed met in September 2014 at the United Nations, and, again, in March at Egypt's economic conference at Sharm. Cairo was the second country following Sudan to recognise South Sudan after it gained independence from its northern neighbour in 2011. Hope egyptian and the government of Egypt know how to select friends in the region, but i want them to see carefully on Eritrea matter, the government of Eritrea had no legitimate power in z country and well known in destabilising z region so how can be friend of egyptian, so we r seeing their friendship with carefully. It is good to be friends rather than being an enemy smart way Eritrean. We all should be friend for betterment of our society and our people with open hearts and mind. In this way we can achieve the goal of every body target development and prosperity to all of us.